Whenever I'm on a ride and see a cyclist at the side of the road or trail, I ask if they need anything, if they're okay. The usual response is "I'm fine" or something to that effect. Cyclists can be an independent lot. My wife and I had returned from a trip to Alaska (a subject for another time), and I had an extra day of vacation. She gave me a hall pass for a long ride. Anyway, I gave my usual "You folks okay?" greeting and got a response I'd never heard before -- "NO!" Okay, to be completely honest, with an almost-three-year-old, that's probably the most-used word in the household. But this is the first time I've gotten that response in this setting. I stopped and leaned my bike against the bench that was serving as their make-shift tool shelf, and walked around to see what I could do. "I don't think we've got this right." What I observed then was something that required some certain amount of talent to accomplish, and I wish I'd taken a picture. 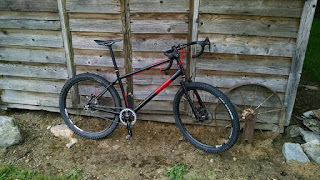 It was apparent that the bike in question had suffered a flat on the rear tire, and while they'd gotten the tube replaced appropriately, replacing that wheel into the frame and getting the chain threaded in the proper manner is what vexed them. They had, SOMEhow, managed to get the chain onto the cassette threaded BETWEEN the rear derailleur jockey wheels. WITH the quick release in place. As I said, I wish I'd taken a picture. Getting the wheel out was a bit of a chore. I had to remove the quick release and use some considerable force to get it out. After that point, it was an easy, if a bit messy, job of installing the wheel correctly. A spin of the cranks to make sure everything was moving freely, and it was road-worthy again. One of them offered a handkerchief to wipe my hands of the excess of chain lube with which I'd coated my fingers, but I just wiped them on my shorts ("That's why they're made in black."). They thanked me profusely, to which I replied "No problem." I grabbed my bike and rode on the rest of my route. They were actually quite close to correct in threading in the wheel. Without pulling the rear derailleur out of the way when pushing the wheel into place, the logical place for that cog might just appear to be between the jockey wheels. How to physically accomplish that, though, is beyond me. So check off one more thing from the list of "that's never happened". 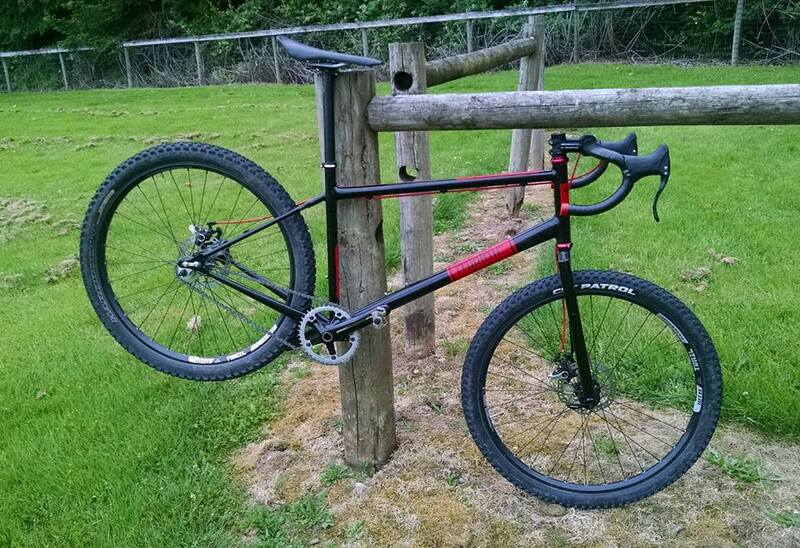 It's always fun taking a new frame out for its maiden voyage. All the time designing the frame, cutting the tubes, brazing them together, finishing the joints to nice-and-smooth, painting... Then the parts build-up. And it's finally ready to get dirty. As much as I trust my own skill in frame building, there's always a little trepidation, especially taking a new build into the rough stuff. But it quickly fades with each bump, loft and jump, and then it's fully game-on time. Today was that day for my unsuspended single-speed mountain bike. 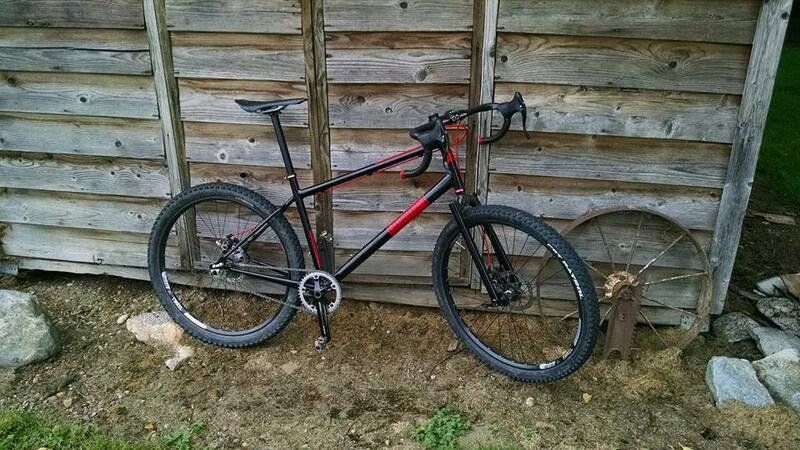 Most of the parts came off my old Specialized Hardrock frame, save the headset and seatpost. 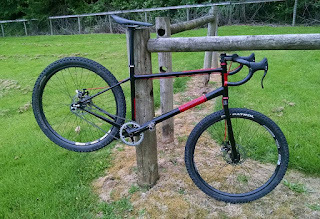 This bike's main use is for my lunchtime rides around my work site, with acres and acres of woods laced with gravel service roads and a slowly-increasing network of twisty dirt singletrack. There aren't any big hills, so a large range of gears just isn't needed. The front geometry is long and slack, with a rather short back end. This keeps the front wheel light for lofting even when I'm out of the saddle. Handling is different than most -- at very slow speeds the front wheel wants to tip into corners, but at most trail speeds that makes the handling feel intuitive, almost like the bike is reading my mind. The short rear keeps power transfer efficient and snappy. The single speed drive train, without idlers, is silent. I like that in an off-road bike. So a good hour-and-a-half on familiar trails was a great first test. And a sign of many happy hours to come.